Mercy Health Saint Mary's is a 371 bed hospital located in Grand Rapids, Michigan. Our hospital joined the HMS collaborative in 2012. 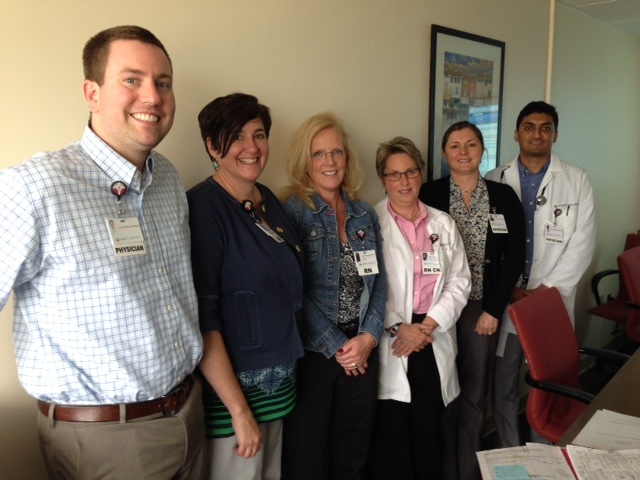 Our HMS team includes Dr. Ahmad Masood as physician champion, Amie Dlouhy as our quality administrative lead, and Kathy Lee Scranton as the clinical data abstractor. Drs. Abdur Rehman, Bilal Ali, Lisa Kinsey-Callaway and Richard Sadowski are also involved with the HMS-related work. This has been an exciting opportunity for our organization to participate in this collaborative process with HMS. We feel that this opportunity is helping transform healthcare across the nation but specifically within Michigan and our own healthcare system. We found our initial data noteworthy because many of our patients did not have a completed risk advisor done on admission. Since this initial data, we have made incremental improvements with the risk advisor now being a hard stop within our system of care. Our organization continues to provide quality improvement efforts that aim toward defining risk factors that result in over prophylaxis and produce unintended increase with bleeding and financial cost . We have provided ongoing education to our physicians and residents which has helped in enhancing safe care surrounding prophylaxis. 1. MHSM organized a VTE committee that meets monthly to review cases identified in weekly cycle defect reports as potential fallouts – discrepancies in VTE risk scores, low risk patients receiving pharmacologic prophylaxis, and overt bleeds. 2. VTE Discern Advisor went live in December 2013. The VTE Advisor guides clinicians to select an appropriate VTE Prophylaxis regimen. The VTE Advisor is available in all Admission PowerPlans and Orders Sets. 3. Implementation of the Concurrent Reviewer Role, October 2013. MHSM has a total of 4 full-time registered nurses charged with identifying real time events in order to increase patient safety and improve patient outcomes. 4. The VTE Advisor daily report began in December 2013. Daily review provides real time monitoring of incomplete VTE risk assessments, appropriate pharmacologic prophylaxis (pharm ppx), and identification of physician/mid-level providers who may benefit from at-the-elbow education. 5. Development of an early vascular access assessment screening tool in addition to the data we collecting for the HMS PICC appropriateness initiative. The early vascular access assessment process is based on the national Infusion Nursing Standards of Practice which identify that a comprehensive plan of care should be developed for patients who require infusion therapy. The elements of assessment include determining the length of time the patient will require the prescribed infusion therapy (based on disease state and co-morbidities that typically require central access), the pH and Osmolality of the prescribed medication (guide decision making about type of vascular access device for the prescribed infusion therapy), the patient's vascular access history, and the condition of the patient's vasculature (based on number of IV attempts and number of peripheral IV devices this hospital admission). 6. The early vascular access assessment screening tool is available as a computerized report and our next steps will be to put a process in place to facilitate early detection and care planning processes to facilitate patient safety, satisfaction, and quality outcomes.